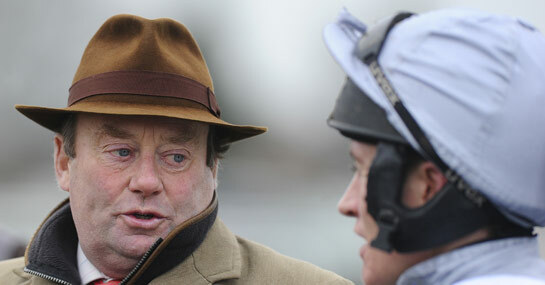 Former Cheltenham Festival winner Hunt Ball is yet to run for champion trainer Nicky Henderson since coming back from a disappointing spell in the US, but the classy chaser could be set for a March return to Prestbury Park if he performs well at Ascot this weekend. Hunt Ball is one of eight overnight entries for Saturday’s Betfair Ascot Chase at odds of 16/1 and while Henderson’s inmate may be best watched on a course, and over a distance, he has never won at, taking on last year’s runner-up Captain Chris should flesh out the 2012 Pultenay Novices’ Chase winner’s form ahead of this spring’s spectacle. Connections have been readying Hunt Ball for a return to the Gloucestershire track since the nine-year-old left the States and while a crack at the Grand National at 50/1 odds has not been ruled out, the Ryanair Chase, for which he can be backed at 25/1, looks a more realistic target. The Winged Love gelding was one of the stars of the 2011/12 National Hunt campaign, with seven wins taking his lowly rating of 69 at the start of the season to 162 by the summer. His eight-length thumping of White Star Line in the last race on Cheltenham Festival Friday of that year, when 13/2 favourite, capped a remarkable run of form over fences, but a solid if unspectacular 2012/13 season finished with the horse being picked up by US-based syndicate Atlantic Equine. Hunt Ball clearly hasn’t run to form since leaving England – his highest placing in four races in the States was sixth – but Henderson has been waxing lyrical about his new jumper and the Seven Barrows handler doesn’t tend to persevere with horses unless they still have something in the tank. The trip round Ascot is likely to prove a tad sharp for Hunt Ball, but a horse that’s only been out of the first four once in six runs around Cheltenham should be watched carefully ahead of another likely crack at the festival next month.